Most Wild rabbits live for less than one year. 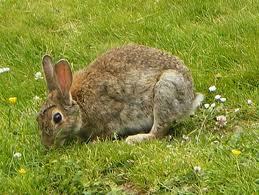 Rabbit's can live almost anywhere they are able to dig burrows. Their natural habitats include woods, meadows, forests, farmland, grassland, moorlands, salt marshes, embankments, sand dunes and cliffs. Empty cliff burrows are often taken over by nesting puffins and shearwaters. 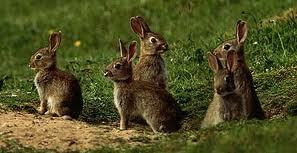 Rabbits, being sociable animals, live in groups or colonies, in burrow systems known as warrens. The warren can be 3 meters in depth and cover a large area with many entrances. The warren is dug with interconnecting tunnels running off in all directions containing living quarters, nesting areas, bolt runs and emergency exits. Usually a dominant doe within the colony will fight other does for the best nesting site. Dominant rabbits are the most successful at breeding. Dominant bucks run up and down boundary lines marking their territory by depositing droppings, scratching out shallow scrapes or rubbing their chin in the ground, marking their area with scent from their glands. Subordinate or lesser ranking rabbits do not establish a territory and will be warned off if they venture into the territory of a dominant rabbit. They do, however, mix happily with other subordinate rabbits. Rabbits are mainly nocturnal. Much of the day is spent underground, resting and passing soft, dark droppings which are eaten to extract more nourishment from them. The rabbits then produce hard, pellet-like droppings above ground. This keeps living areas free of droppings. Usually only coming out of their burrows at dawn and dusk, wild rabbits can, however, be spotted in broad daylight on warm, sunny days, or in undisturbed places. Rabbits graze and feed close to their warren. You may see areas where the vegetation is shorter than surrounding areas. 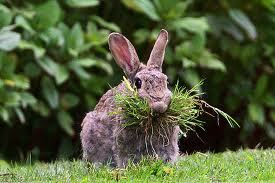 Wild rabbits keep themselves clean by washing regularly and grooming, using their teeth, tongue and claws. The rabbit is a prey animal and has many enemies. They have a remarkably wide field of vision and can naturally see over a wide area including a good deal of overhead scanning. 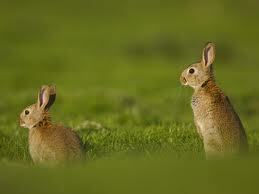 Always on the alert for danger, if a rabbit spots danger, it will warn others by thumping with a hind foot. The flash of white from under its tail as it runs for its burrow also acts as an alarm signal. If confronted by a potential threat, a rabbit may freeze and observe, then warn others in the warren with powerful thumps on the ground. They survive predators by burrowing, hopping away in a zig- zag motion, and, if captured, delivering powerful kicks with their hind legs. Their strong teeth allow them to eat and to bite in order to escape a struggle. Rabbits have a very rapid reproductive rate. In one year, a doe can produce more than 20 offspring with many of these breeding themselves, when only a few months old. This prolific breeding is usually balanced by many deaths caused by predators, disease, road traffic, shooting and trapping. A wild rabbit's predators include foxes, badgers, stoats, weasels, buzzards, cats and of course man. The breeding season for most rabbits lasts around 9 months, starting January/February to October, with Spring and Summer being the main reproductive periods. In Australia & New Zealand breeding season is late July to late January. Courtship and mating are very brief, lasting less than a minute. Courtship behaviour involves licking, sniffing, with the buck following the doe. Ovulation begins 10 hours after mating. Spraying urine is common sexual behaviour. The doe will build her nest in a separate burrow in the warren, called a 'stop'. The 'stop' can be a separately dug burrow, which may eventually become starting point of a new community. The doe's nest will consist of grass, hay or straw lined with the doe's own plucked fur and each doe keeps within her own territory in the warren. A buck will mate with several does, but takes no part in the rearing of the young and may even kill them. It is possible for a doe to produce a litter of young every month. However, this rarely happens. Over half of the young conceived die before they are born and are reabsorbed back into the mother's body. Gestation period (period between mating and birth) will be 28 to 31 days and a litter of baby rabbits (kits) varies from 3 to 12. The female rabbit may lose clumps of hair during the gestation period. Baby rabbits are blind, deaf and furless at birth with the mother visiting them for just a few minutes each day to suckle them. She seals the nest chamber with soil to conserve heat and safeguard against enemies. 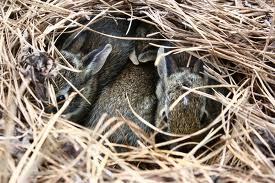 By the 8th day, the young rabbits are covered with fur and two days later their eyes open. By the 16th day, they will be moving out of the burrow and starting to eat solid food. By day 30 they will be weaned, independent and their mother will already have mated and be expecting another litter. Wild rabbits do not vary much from each other in body proportions. Their size can range from 8 inches (20cm) to 20 inches (50cm) in length and .9 lbs (.4 kg) to more than 4.4 lbs (2 kg) in weight. The fur is long and soft with shades of brown, gray/grey and buff.